LONDON (AP) — British lawmakers are set to debate a call for U.S. President Donald Trump to be denied a state visit to the U.K. — but the Conservative government insists the invitation remains firmly in place. On state visits, foreign leaders are welcomed with royal pomp and military ceremony, and usually stay at Buckingham Palace as guests of Queen Elizabeth II. Lawmakers will also consider an opposing petition, with more than 300,000 signatures, backing the state visit. All petitions that receive more than 100,000 signatures are eligible for debate in parliament, though not a binding vote. During her 65-year reign, the queen has welcomed many leaders with less-than-spotless records, including Russian President Vladimir Putin and the late Romanian dictator Nicolae Ceausescu. A 2015 state visit by Chinese President Xi Jinping drew protests from Tibetan groups and human rights activists. But Trump’s invitation has sparked unprecedented opposition, especially after his executive order temporarily barring citizens of seven majority-Muslim nations from entering the United States. 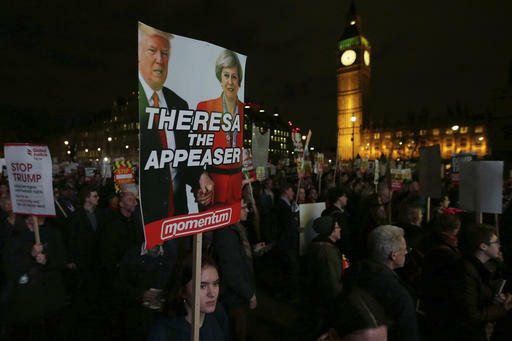 Thousands of people demonstrated against the order in British towns and cities, and London Mayor Sadiq Khan urged the government to reconsider its invitation in light of Trump’s “cruel” migrant ban, which has since been suspended by U.S. courts. House of Commons Speaker John Bercow set aside his customary political neutrality to say that Trump should not be invited to address Parliament when he comes to Britain — an honor given to his predecessor, Barack Obama. “We look forward to welcoming President Trump once dates and arrangements are finalized,” it said. Tags: #DonaldTrump, London, Politics, UKlawmakers. Bookmark the permalink.